Written by John Jay Singleton on August 25, 2017 . Posted in Anarchism. Chasseur was a Baltimore Clipper commanded by Captain Thomas Boyle, an American privateer. 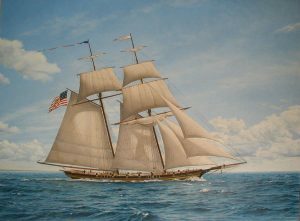 She sailed from Fells Point in Baltimore, where she had been launched from Thomas Kemp‘s shipyard in 1812. On his first voyage as master of Chasseur in 1814, Boyle unexpectedly sailed east, directly to the British Isles, where he harassed the British merchant fleet. Boyle sent a notice to King George III by way of a captured merchant vessel that he had released for the purpose. The notice, he commanded, was to be posted on the door of Lloyd’s of London, the shipping underwriters. In it he declared that the entire British Isles were under naval blockade by Chasseur alone. This affront sent the shipping community into panic and caused the Admiralty to call vessels home from the American war to guard merchant ships which had to sail in convoys. In all, Chasseur captured or sank 17 vessels before returning home. On February 26, 1815, just off Havana, Chasseur took HMS St Lawrence. Chasseur carried 14 guns and 102 men, while St Lawrence carried 13 guns and 76 men. The intense action lasted only about 15 minutes, during which St Lawrence suffered six men killed and 17 wounded, several of them mortally. (According to American accounts, the English had 15 killed and 25 wounded.) Chasseur had five killed and eight wounded, including her captain. Both vessels were badly damaged. Captain Boyle, of Chasseur, made a cartel of St Lawrence and sent her and her crew into Havana as his prize.